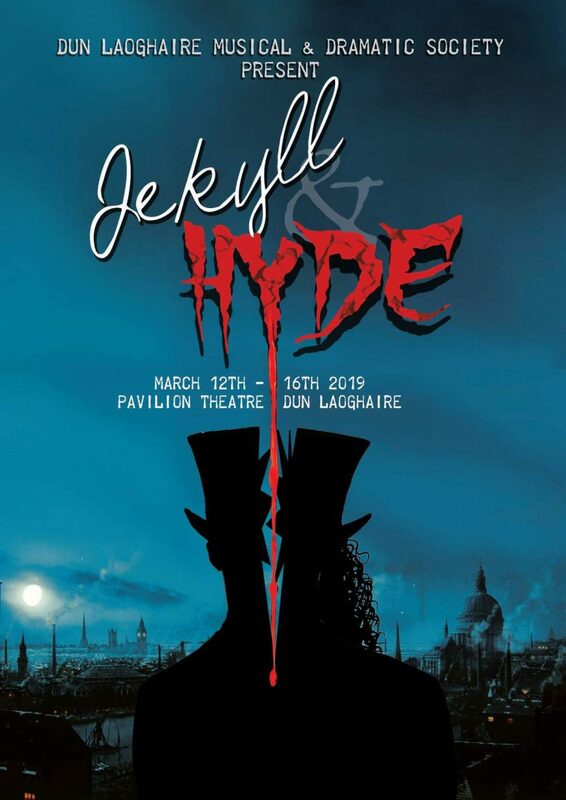 The show will take place in the Pavilion Theatre, Dun Laoghaire from 12th March to 16th March. Please save these dates in your diaries for work purposes and remember to keep weekends in the run up, and also the evenings in the week prior to the show, free for rehearsals! 🙂 Rehearsals will likely begin in October with auditions to be held in late September. We of course will update you on that as soon as dates are set! Have a wonderful Bank Holiday Weekend! 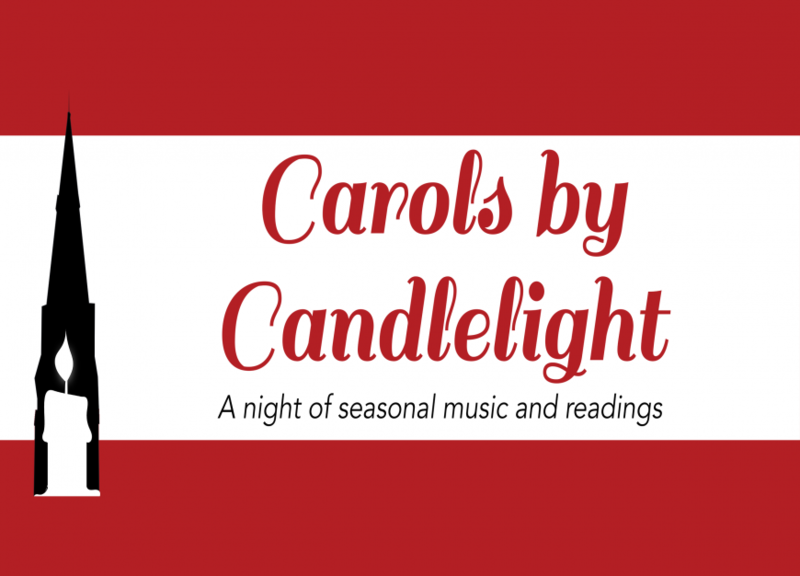 Last year’s event was a fantastic evening, with a mixture of music and readings followed by a reception of mulled wine and other seasonal fare for the audience. 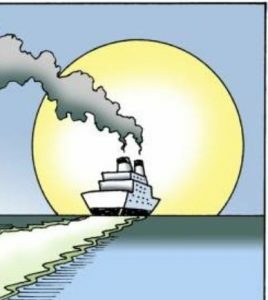 It was a great success, and we’re going to do it again. The Dun Laoghaire Methodist Church is unavailable this year, so we’ll be holding this event in the former Mariner’s Church – now the National Maritime Museum of Ireland – a wonderful atmospheric building adjactent to dlr LexIcon which overlooks the East Pier, Dun Laoghaire Harbour. We’re also delight to have the chance to perform for two nights this time – one being organised directly by the Museum on Thursday 14th December, and the other being organised for our own audience and funds, on Sunday 17th December. This event is SOLD OUT. Our apologies if you were unable to secure a ticket. Our next major performance will be Oliver! from 14 to 18th March in the Pavilion Theatre. 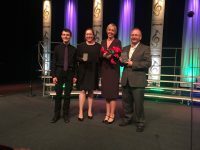 The chorus from Dun Laoghaire Musical Society (DMDS) won the ‘Just for Fun’ choir competition at the North Wales International Choral Festival in Llandudno last weekend. 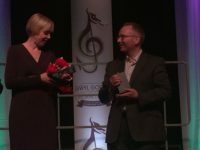 This is a major international competition with over 70 choirs competing in different categories. 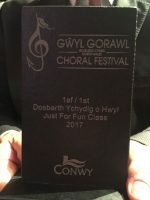 This was the second win in a row for DMDS in the ‘Just for Fun’ category in which 11 choirs competed. The chorus of 38, conducted by Des Cox, performed: Baba Yetu, Sing a Song of Sixpence, and Fix You. As you all know, we can’t do the things we like to do on stage without some serious effort in making money beforehand. This is particularly true as we make our plans to stage Oliver! 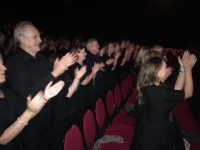 in the Pavilion Theatre in mid-March. But the focus is on the FUN in the FUNdraising. 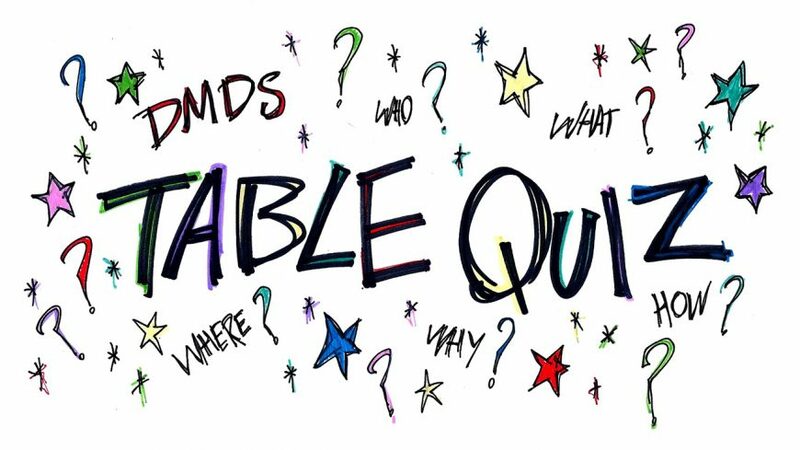 So our first event is a Table Quiz, which will be held in the Purty Loft on Thursday 23rd of November at 8pm. More details will follow, but for now, please just stick it in the diary and get a team (or two) of family, friends or colleagues signed up! 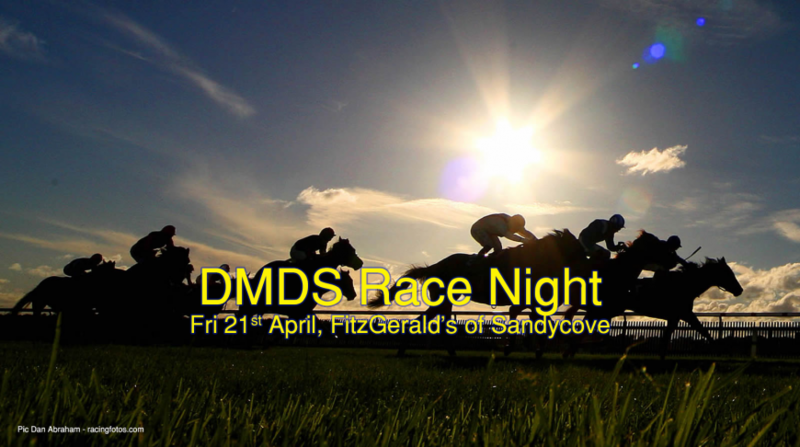 Our next event is a Race-night on 21st April in the wonderful FitzGeralds of Sandycove! invest in a horse in advance (as owner, jockey or trainer) at €10 per slot. If your horse wins you will get a great prize and if second you will get a bottle of wine. You can contact Jim Ryan (jim.ryan(at)circa.ie or 087 2456402) to make your investment. come along to the races on 21st April in Fitzgerald’s of Sandycove at 8PM and bet on the outcome. We hope to see you all there. A sample race card is below and we would be delighted to add your name on the night or in advance. Our next event will be a concert entitled ‘From the Page to the Stage’ which will feature a collection of smash hits from Musicals, all of which are based on books and plays. The evening will include pieces from Les Miserables, Oliver, West Side Story, Phantom of the Opera, Man of La Mancha, Children of Eden and others. It will include choral pieces from our award-winning choir, and also many solos and duets. 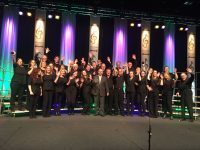 Our choir has won two major competitions within the last year and we look forward to entertaining you. 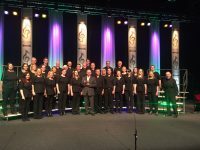 The concert will take place in the dlr Lexicon Theatre, Dún Laoghaire, from Tuesday 28th March to Saturday 1 st April at 8pm nightly. The theatre is located on the lower level of the new Dún Laoghaire Public library. Tickets are €15 and are available from info@dmds.ie or 086-3246032. 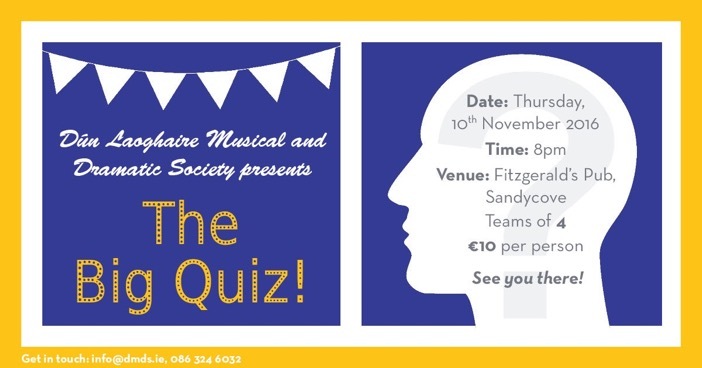 The Table Quiz will take place on Thurs 10th November in Fitzgerald’s of Sandycove from 8pm (starting 8.30pm). Teams can have up to FOUR members and entry is €10 per person. There will be lots of spot prizes and other prizes to be won, and some rounds of questions just for musical fans. Get your team together and come along. It is also an important fund-raising event for the society so please promote it to your friends and family.